As evidenced by the full-blown controversy surrounding Starbucks' green "unity" cups last year and the annual freak-outs over its red holiday cups, any change the coffee giant makes to its iconic paper caffeine delivery vessels can end up turning into a big deal. 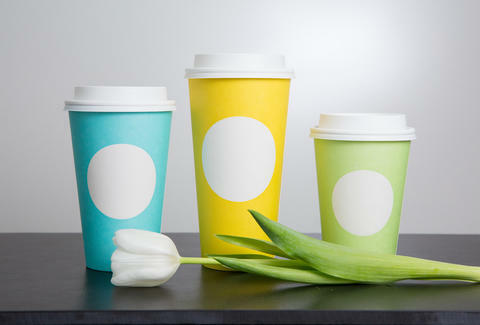 Well, it looks like the company is about to shake up its cups yet again, and this time, with its first-ever spring cups. Starbucks announced Thursday that its celebrating the arrival of spring later this month by introducing limited-edition cups featuring bright cheerful colors -- blue, yellow, and green -- often associated with the season. What you won't see on the cups, though, is Starbucks' iconic siren logo. 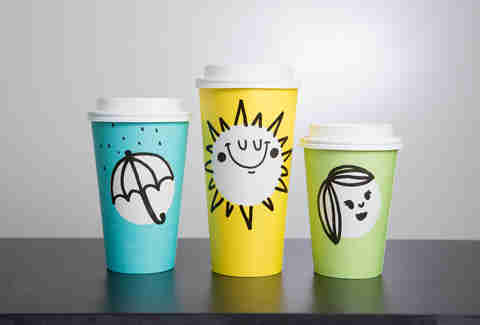 Instead, some of the cups sport a minimalist white circle in the middle, while others come with hand-drawn designs such as an umbrella, a smiling sun, and a rabbit. Quick! Someone queue the inevitable misplaced outrage. Although the official start of spring is March 20, the cups will be available at Starbucks locations in the US and Canada, starting on March 16. But just like the beautiful spring weather in most places, the colorful cups will only be around for a few days. Instagram will never be the same. Tony Merevick is Cities News Editor at Thrillist and wonders how long it will take for someone to start boycotting Starbucks over these things. Send news tips to news@thrillist.com and follow him on Twitter @tonymerevick.